From day to day shall live. Over the past decades there has been an upsurge of interest in 'the Camino', the pilgrim's route to Santiago de Compostela in northern Spain. But where does this fascination in the spiritual exploration of the Middle Ages come from, and what is its significance? Rudolf Steiner stated that people have a need to live not only with external history but also with the esoteric, hidden narrative that lies behind it. Now, at the beginning of the twenty-first century, it is increasingly necessary for us to live consciously with this veiled history of humanity's search for communion with the divine world. It is within this context that the Camino's historic importance is re-echoed in many souls today. 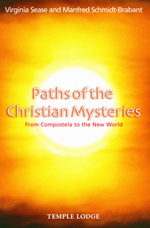 Based on lifelong research and contemplation, Paths of the Christian Mysteries presents a survey of extraordinary breadth and depth, taking us from the cosmic origin of the Grail Mysteries to the supersensible Michael Cultus and the Being Anthroposophia. The intervening chapters present studies of the School of Athens, early Christian art and its Gnostic impulses, the Grail Initiation in northern Spain, the role of the Cathars and Troubadours in the Manichaean stream, the Camino to Santiago de Compostela and the esoteric aspect of music for the pilgrims, the Music of the Spheres and the Elders of the Apocalypse, the Templars as emissaries of the Holy Grail, the initiations of Christian Rosenkreutz and his relation to anthroposophical art, and the early Rosicrucian impulses in America and Europe. MANFRED SCHMIDT-BRABANT was born in Berlin, Germany in 1926. He became a member of the Executive Council of the General Anthroposophical Society at the Goetheanum in Dornach, Switzerland, in 1975 and served as Chair of the Council from 1984 until his death in 2001. His service during those years included leadership of the Social Science Section of the School of Spiritual Science, and he lectured around the world on many subjects. English editions of his books include The Spiritual Tasks of the Homemaker and (with Virginia Sease) The Archetypal Feminine, The New Mysteries and Thinkers, Saints, Heretics. VIRGINIA SEASE was born in the United States in 1935, and received a Doctor of Philosophy degree in 1969. She has been a member of the Executive Council of the General Anthroposophical Society since 1984, and served from 1991-2001 as leader of the Section for the Arts of Eurythmy, Speech, Drama and Music. Her current responsibilities include liaising between the Executive Council and English-speaking anthroposophists around the world, and directing the English Anthroposophical Studies Programme at the Goetheanum.